Bertha LaBranche Johnson was a leading advocate for black education, founding two schools and serving as a leader and member of many civic and political organizations. Born in Wesson, Mississippi, to Jule LaBranche and Orrie Smith LaBranche, Bertha attended Tuskegee Institute, graduating with a bachelor’s degree in 1902. In 1904 she married Jonas Edward Johnson (1873–1953), and they went on to have three children, Alcee, Onette, and Eva. 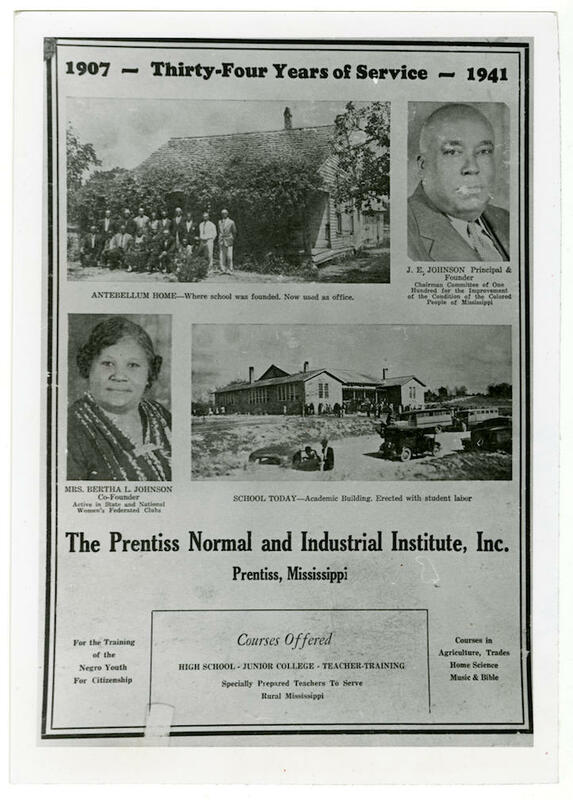 Bertha and Jonas Johnson cofounded the Prentiss Normal and Industrial Institute in Jefferson Davis County to continue the Tuskegee Institute’s emphasis on the training of the “head, heart, and hand.” With financial backing from local black farmers, the Johnsons secured a six-hundred-dollar loan from a white banker. The original school, an elementary, was situated on forty acres, and the founders recruited the first students by traveling to rural areas. When the school opened its doors in 1906, many of its forty students paid for their education with produce and chickens from their farms. By 1953 the school had expanded to include a high school and junior college, with forty-four faculty members serving seven hundred students on a five-hundred-acre campus. In 1927 Bertha Johnson also founded Laurel’s Oak Park Vocational School, the state’s first municipally maintained agricultural and vocational school for African Americans. Situated on 259 acres, the school had buildings for manual arts and home economics and a large area for agricultural production. Both Oak Park and the Prentiss Institute received acclaim from Johnson’s former teacher, Booker T. Washington, and from George Washington Carver. In 1941 Johnson received an honorary master’s degree from Tuskegee. Despite Prentiss’s success, enrollment dwindled with integration and the opening of other educational opportunities to black students, and the school closed its doors in 1989. After the school closed, the building served various community groups and the local Head Start. The campus included a classroom building built in 1926 and paid for by the Rosenwald Foundation, a philanthropic organization that funded one in five rural black schools in the South in the first decades of the twentieth century. In 2006 the National Trust for Historic Preservation identified the building as an endangered historic place, and in 2006 and 2009, the Prentiss Institute Board of Trustees obtained grants from the Mississippi Department of Archives and History and the Lowe’s Charitable and Educational Foundation Preservation Fund to restore the structure. With additional funding from alumni and supporters, the Rosenwald School was restored, and it reopened in 2013 as a venue for weddings and other special events. The Mississippi Department of Archives and History has recognized it as a historic landmark, and it is listed on the National Register of Historic Places. Alcee Johnson (1905–95) was a member of the National Association for the Advancement of Colored People (NAACP), and because he served as Prentiss’s manager, the school came under the surveillance of the Mississippi State Sovereignty Commission, which called the institution a “hotbed of NAACP activity” and noted Johnson’s support for integration. The commission files also noted Bertha Johnson’s backing of a student strike at Alcorn State and followed the activity of several other family members. Bertha Johnson held numerous posts with civic organizations. She served as president of the Mississippi State Federation of Colored Women’s Clubs for six years and vice president for ten years and as the statistician for the national federation for five years. Johnson championed issues such as the care and housing of elderly black Mississippians, the creation of libraries in black schools, and the addition of African American history to the state’s curriculum. The federation also worked to address the needs of black tuberculosis patients and to build educational facilities for special needs children. In addition, Johnson was a member of the executive council of the Committee of Interracial Cooperation and a member of the Mississippi Association of Teachers in Colored Schools.